“Strikeforce: Barnett vs. Cormier” takes place May 19th inside HP Pavilion in San Jose, California. UFC Fight Club members will have the opportunity to purchase seats for the show on Thursday, April 5th at 1PM ET/10AM PT until 3PM ET/12PM PT. A special Internet ticket pre-sale will be available to Strikeforce and UFC Newsletter subscribers that same Thursday starting at 3PM ET/12PM PT. The general public will have access to the remains on Friday, April 6th at 1PM ET/10AM PT via Ticketmaster. 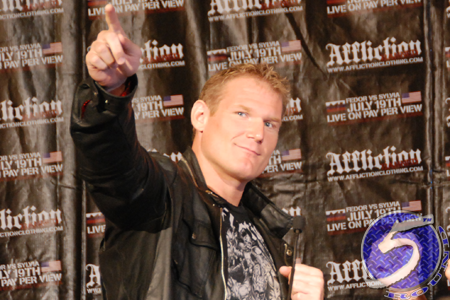 Josh Barnett (Pictured) and Daniel Cormier will headline the festivities by meeting in the finals of the Heavyweight Grand Prix. The contest marks the second-to-last 265-pound affair under Strikeforce’s banner. The victor is expected to fight one more time against a “top tier” heavyweight before the organization erases the division. No other bouts have been confirmed for the card thus far.